As most wrestling fans know, one of the biggest events to hit the WWE recently was UFC Hall of Famer Ronda Rousey joining the sport. Now that she’s made her real-life debut in the WWE, it’s time for her to make her virtual one. The MMA fighter will be joining the roster of WWE 2K19 as a pre-order bonus character, 2K Games announced Tuesday. Rousey took the wrestling world by storm when she made appearances at the 2018 Royal Rumble and Wrestlemania 34. Her addition to the game is no surprise: The MMA star is a fan favorite with her badass attitude and renowned Judo skills. The former UFC champ defended her title as UFC Women’s Bantamweight Champion for six consecutive fights until she lost the belt to Holly Holm in her seventh title defense match. From an Olympic tatami to the UFC Octagon to the WWE ring, Ronda is a one-of-a-kind athlete and incredible ambassador for career and life empowerment. Her discipline, determination and attitude toward accomplishing her goals and silencing her critics make her the perfect embodiment of WWE 2K19’s ‘Never Say Never’ global marketing campaign. We are thrilled to welcome Ronda to the WWE 2K family and can’t wait to see what’s in store for her in the years to come. Rousey will be the second preorder character announced for the game, joining Rey Mysterio. Fans of Rousey will want to preorder the Deluxe or Collector’s Edition of the game. Both editions come with early access, which means that players will get their hands on WWE 2K19 four days earlier than its Oct. 9 release date. Players who preorder these editions will also receive Rey Mysterio and Ronda Rousey as playable characters, along with several in-game offerings that will be announced later this summer. 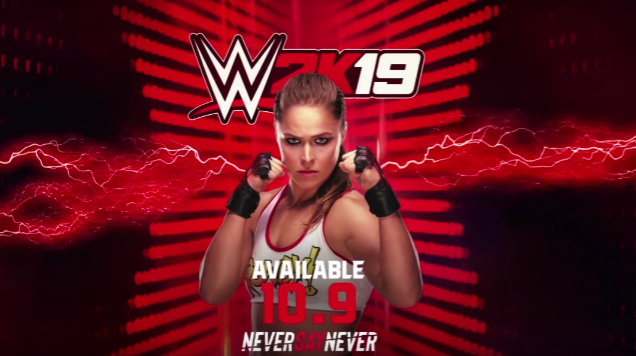 See Rousey make her WWE 2K19 debut in the announcement trailer below.